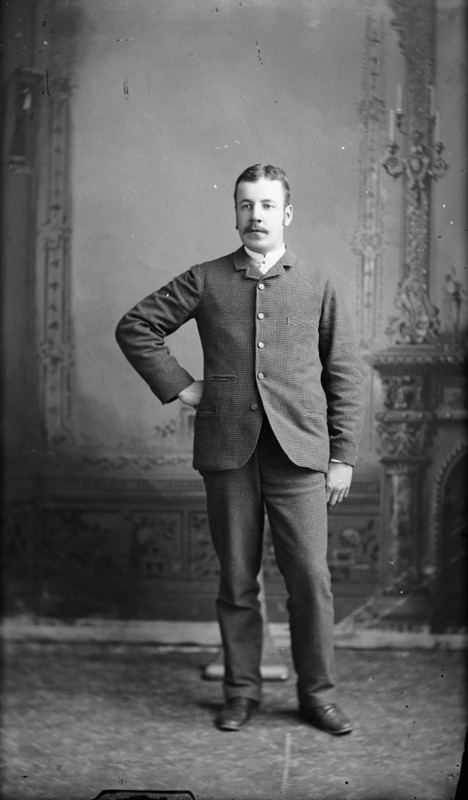 Albert Peter Low was a geologist and explorer, whose expeditions to Quebec and Labrador from 1893 to 1895 assisted in the creation of their borders. Low mapped the interior of Labrador and discovered large iron deposits, which later lead to the development of the iron mine at what is now Labrador City. His mapping of Labrador influenced expeditions after him including that of Mina Hubbard in 1905. In 1903 and 1904, Low commanded two expeditions on the steamer Neptune up the west coast of Hudson Bay where he formally claimed possession of Southampton, Ellesmere, and adjacent islands for Canada. Low detailed his travels in Cruise of the Neptune (Report on the Dominion Government Expedition to Hudson Bay and the Arctic Islands on Board the D.G.S. Neptune 1903-1904). Much of his research was invaluable in the recording of Inuit culture in Quebec, Nunavut, and Newfoundland and Labrador. The Albert Peter Low fonds includes photographs, proclamations, and journals, two from a prospecting trip along the east coast of Hudson Bay, now known as the Inuit region of Nunavik, Quebec and one notebook written between 1901 and 1907. 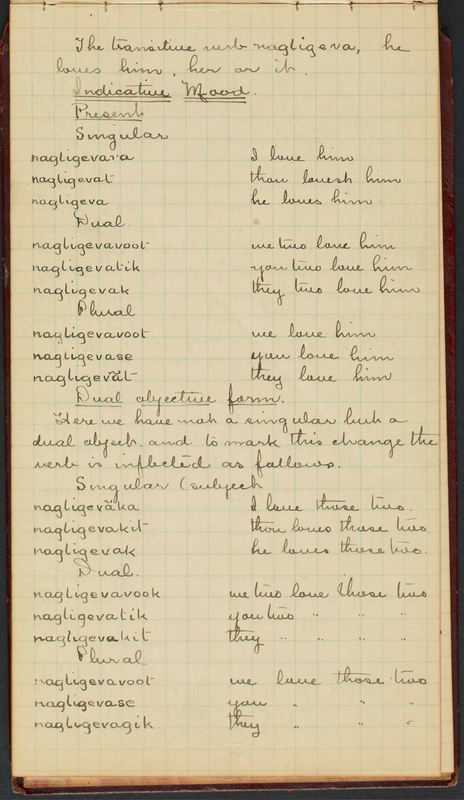 The notebook records 40 pages of the many tenses and corresponding suffixes of the verb “to love” in Inuktitut. In the photo below, we see a notebook page starting with the basic form “him, her or it loves.” He moves on to record, in lesser detail, the variations of the verb “to teach.” At the end he lists other transitive verbs, passive verbs, and adverbs, many related to Christianity. In 1886, Low married Isabella Cunningham and they had three children. Sadly, their first son died as an infant in 1898, and their second son died at age 19 during the Spanish Flu epidemic. Only their daughter Estelle, born in 1901, survived to adulthood and looked after her ailing father until his death in 1942. In 1943, she donated his collection to the Public Archives of Canada, which included Inuit art, mainly hunting scenes rendered in ivory. The collection was transferred to the Museum of Man (Canadian Museum of History) in 1962. Most of the works are miniature ivories created by Harry Teseuke, leader of the Aivilingmiut and Captain Comer’s mate. 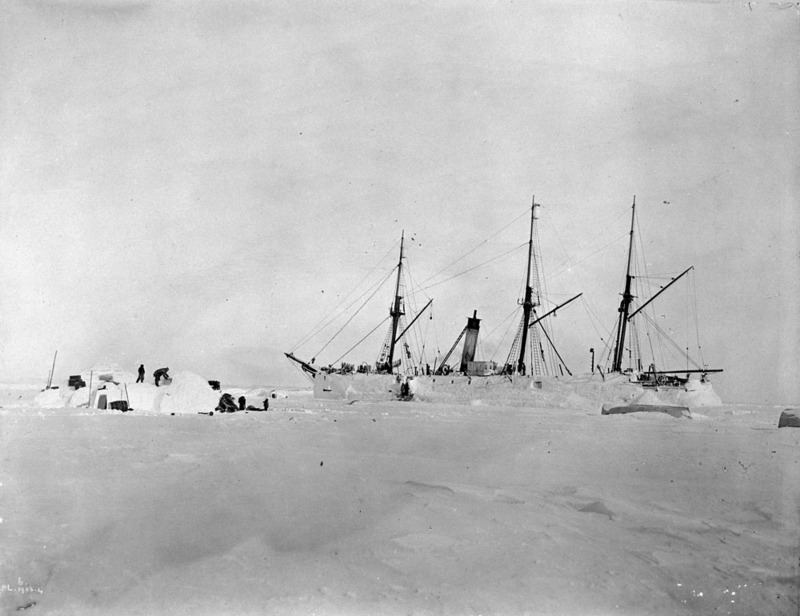 Comer’s ship, Era, wintered in Fullerton Harbour (near Chesterfield Inlet, Nunavut) in 1903–1904. Low likely consulted with Teseuke who may have enlisted others to assist with Low’s research. Although this journal is an extensive study of the sentence structure and grammar of Inuktitut, it also sheds light on Inuit culture. You’ll notice that verbs have no masculine or feminine forms or gender pronouns. This relates to the practice of naming children, as traditional Inuit names are unisex. And this is tied to the somewhat intricate practice of creating sauniq (namesake) relationships. For example, if a boy was named after a deceased woman with children, those children would address the boy as “my mother” or “my little mother” to acknowledge that special relationship. Bonds are often formed between people who are not related. It’s a lovely way of creating a strong sense of belonging and strengthening interconnectedness within a community. 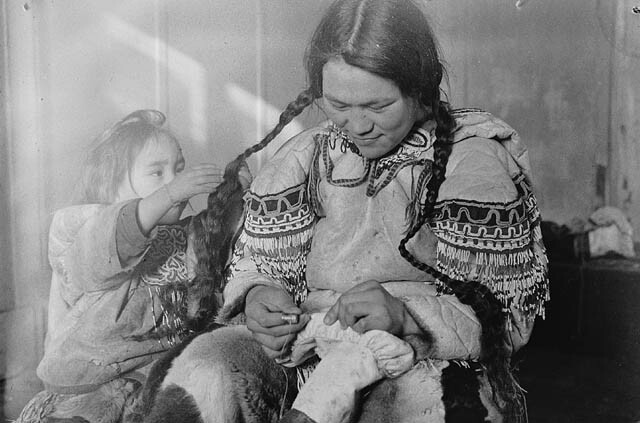 Inuit believe some of the unique characteristics of someone who has passed can live on in their namesake. Of course, love is the tie that binds these concepts. I can’t help but wonder what Low’s fascination was with this particular word. With varied interests including geology, botany, photography, and hockey, he leaves the impression of an educated man with a curious mind. Was it curiosity alone that fed his hunger to know the nature of Inuit love? Despite the study of Inuktitut words related to Christianity, he was familiar with the Inuit traditional practice of polygamy. In Cruise of the Neptune, Low defends the custom, calling it a mistake for missionaries to attempt to abolish the practice. All of this paints a picture of a liberal-minded man and an early ally of Inuit. No personal writing or correspondence by Low has survived. Therefore, we will never truly know what inspired his fascination with Inuit culture and its many expressions of love. This blog is part of a series related to the Indigenous Documentary Heritage Initiatives. Learn how Library and Archives Canada (LAC) increases access to First Nations, Inuit and Métis Nation content and supports communities in the preservation of Indigenous language recordings. Heather Campbell is a researcher for the We Are Here: Sharing Stories project at Library and Archives Canada. The details of when and where our ancestors were born, lived and died are the building blocks of genealogical research. Knowing how they spent their time or were employed can help connect the dots. By any chance, might one of your ancestors have been a certified maritime pilot on the St. Lawrence River? 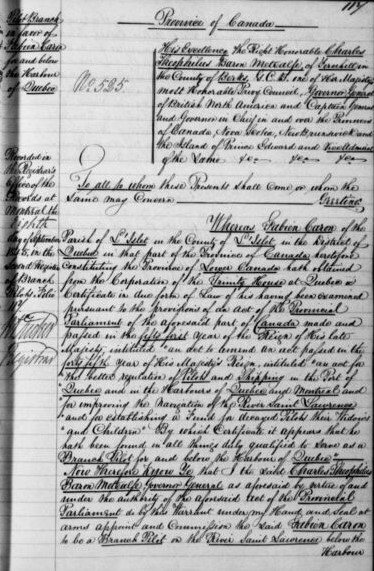 This blog post will focus on records specific to Quebec, beginning with the Trinity House fonds (MG8-A-18), which includes a list of certified maritime pilots for the period 1805–1846. Found in MG8-A-18, Volume 5, this list includes the date of certification and any suspensions of that certification along with reasons for the suspensions. The documentation is in French and arranged in chronological order. This leads us to the Department of Marine fonds (RG42), specifically the “St. Lawrence river pilot’s certificates” series (1762–1840). The certificates are described at the item level in Finding Aid 42-1 and the documents themselves can be found in RG42 volumes 1 through 6, which are open for consultation and reproduction. To find these related records, first consult the General Index on digitized microfilm reel C-2884 on the Héritage website and look for the name of the individual of interest in the alphabetical key at the beginning of the reel. When you identify the individual you are looking for, there may be several pairs of numbers next to his name. For example, if I am looking for Fabien Caron, I will look under ‘C’ to find his name, and will then see that the pair of numbers next to his name is 5, 309. The second number indicates the page of the index where we will find the relevant entry, and the first number indicates the line number on that page. We can scroll ahead on the same microfilm reel to find the general index for the same time period. The fifth line of page 309 does indeed refer to Fabien Caron, and provides us with further information that will allow us to identify the actual certificate: liber 2, folio 117, 5th September 1845. We can now perform a search of the archival database for RG68 and file number 2. By filtering our search results for those from the 1840s we can quickly identify RG68 volume 211, file 2, “Commissions – Branch Pilots” (1838 – 1867) as the relevant source. This volume is available on digitized microfilm reel C-3950. Folio (page) 117 is where we will find the entry for Fabien Caron’s certification. If you think Library and Archives Canada might hold this type of record for one of your ancestors, give this method a try! You never know what you might find. Rebecca Murray is an archivist in Reference Services at Library and Archives Canada. Seals are a central part of life and an essential source of locally-harvested food for Inuit peoples. Many traditions, customs, beliefs and oral histories revolve around the seal. Inuit peoples were and still are in an important and direct relationship with this animal. Inuit hunters have great respect for the spirit of the seal, an animal that is so heavily relied upon. Every single part of the seal is used, as the harvesting must be sustainable, humane and respectful. Most importantly, cold and harsh arctic climates demand that people have the right shelter and clothing to keep warm and dry, and seals help meet this need through their skins, fur and oil. 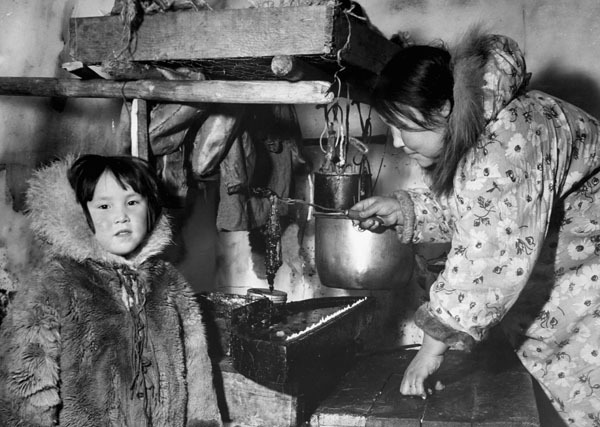 Inuit women developed highly skilled techniques in order to treat and use seal in various ways throughout the seasons. 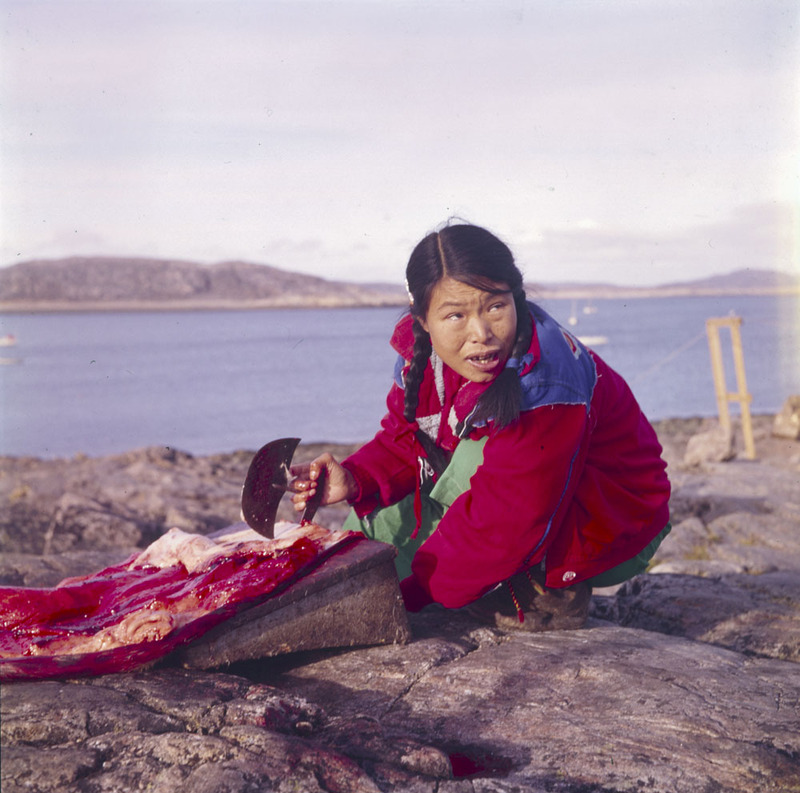 They scraped the skins clean of blubber with an ulu (a traditional, women’s knife with a crescent-shaped blade) then stretched and dried them, as seen in this photograph of Taktu. Today marks the 200th birthday of one of Canada’s most important historical figures, Sir George-Étienne Cartier, a leading Father of Confederation. Cartier was born on September 6, 1814 in Sainte-Antoine-sur-Richelieu, Lower Canada. He studied law and started practising in 1835; however, politics soon became his passion. His entrance into the world of politics was anything but uneventful, as he played a role in the Lower Canadian Rebellion of 1837 and fought in the Battle of Saint-Denis. Cartier subsequently spent a year in exile in Vermont but pled for leniency and returned to Montreal in 1839. 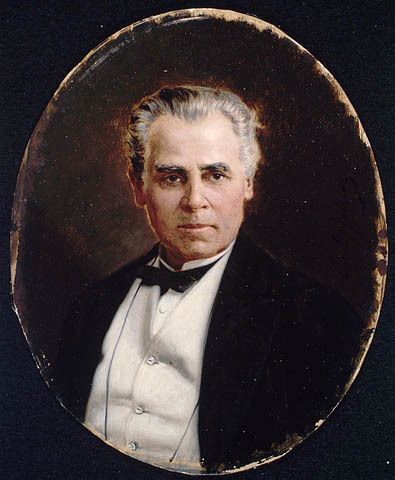 In 1848 Cartier was elected to the Legislative Assembly of the Province of Canada and shortly after was appointed to Cabinet. 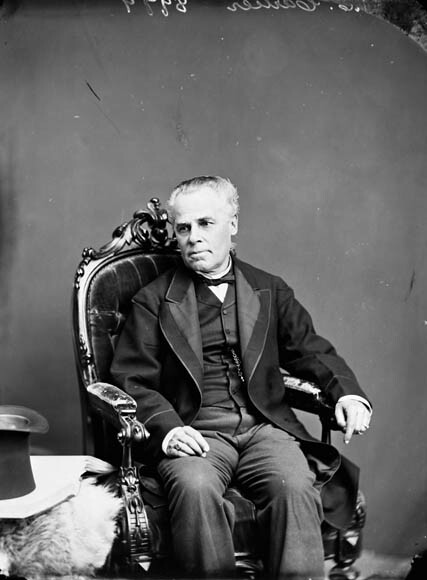 From 1857 to 1862 he served as co-premier of the Province of Canada with Sir John A. Macdonald following his coalition with the Upper Canadian Conservatives. It was in this period that Macdonald and Cartier started working together and began to garner support for Confederation in an attempt to put an end to political instability. 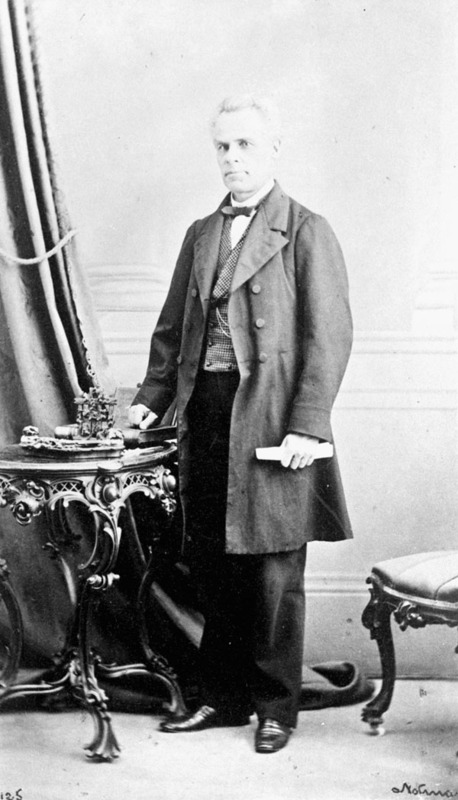 Cartier played a pivotal role in gaining French-Canadian support for Confederation. He argued that francophone interests would be best preserved in a federation of provinces. 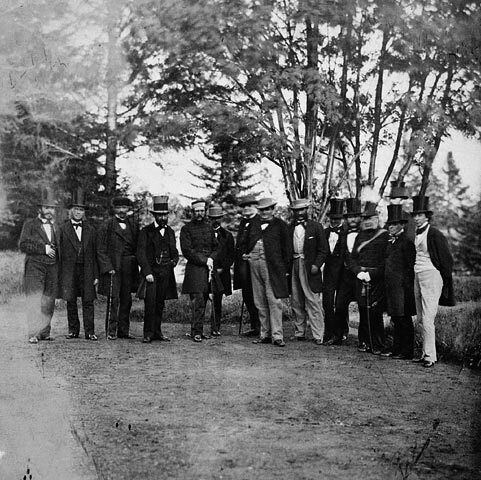 When Confederation finally came about on July 1, 1867, John A. Macdonald became the first Prime Minister and Cartier the first Minister of Militia and Defence. Cartier passed away on May 20, 1873. His death deeply affected his close friend, John A. Macdonald, who proposed that a statue be erected in Cartier’s honour. It was sculpted by Louis-Philippe Hébert and unveiled in 1885. This was the first statue to be placed on Parliament Hill and it can still be seen today. Cartier left his mark on generations of Canadians. The centenary of his birthday in 1914 was marked by large celebrations and another monument was erected, this time in Montreal. Cartier’s Montreal home was designated a National Historic Site. While the majority of Cartier’s papers were destroyed, Library and Archives Canada does have several important records, including a family photo album, postcards, and some correspondence that took place during his period as Minister of Militia and Defence. We also have several letters written by Cartier to Macdonald, found in the Sir John A. Macdonald collection (archived). Would you like to know more about the daily lives of your New France and Quebec ancestors? Then you might be interested in looking at notarial records, where you can find a wealth of information about your ancestors’ goods and properties, and any transactions they may have entered into with others. The oldest known notarial record dates back to 1635. A notarial record is a private agreement written by a notary in the form of a contract. Some of the most common ones are marriage contracts, wills, estate inventories, leases, and sales contracts. Notarial records are held by the Bibliothèque et Archives nationales du Québec (BAnQ), but Library and Archives Canada holds copies of some records in the collection, Fonds des greffes de notaires du Québec. You can also use the advanced archives search to look up the name of an individual or a notary. You can use a variety of tools to search for notarial records. 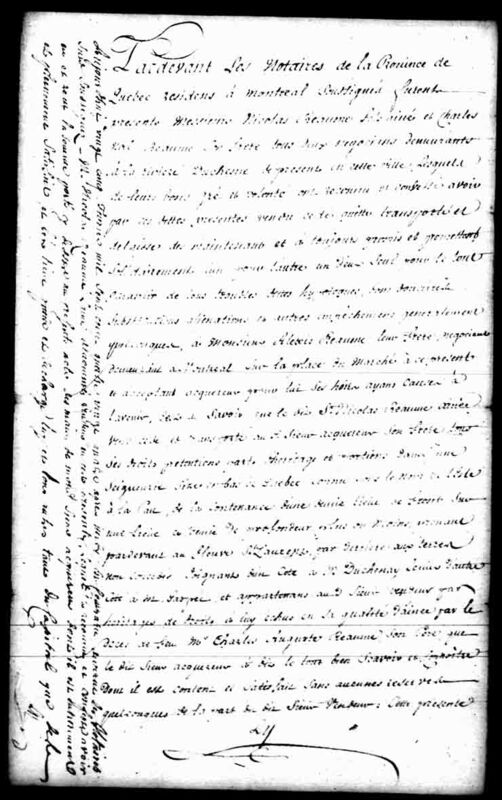 For the oldest records from 1635 to 1784, consult the Parchemin database, developed by the Archiv-Histo historical research society (French only), which provides an abstract of each notarial record (date of the record, name of the notary, names of the parties, etc.). Parchemin is available at BAnQ, and in some public libraries, and archives. You can also consult several name indexes (French only) for various regions in Quebec. Through a large-scale digitization project, you also have access to online directories and indexes of notaries from all regions of Quebec up to 1933 through BAnQ’s Archives des notaires du Québec (French only). Once you have found a reference, you can consult the original record on paper or on microfilm. You may even be able to consult it online as BAnQ, in collaboration with FamilySearch, will eventually have all the records available online. When looking through old French records, you will frequently come across old measurements that are rather mysterious nowadays. These measurements are found in records originating in France, Quebec and Louisiana. Below is a table showing the equivalencies, but many online sites offer conversion calculators, even for these old standards. Summer 2013 marks the 350th anniversary of the arrival in New France of the first contingent of the “Filles du roi” (“King’s daughters”), young women who became the ancestors of numerous French-Canadian families. A variety of celebrations are planned throughout Quebec, culminating in the New France Festival (Fêtes de la Nouvelle-France) in Quebec City from August 7 to 11, 2013. Between 1663 and 1673, King Louis XIV supported the emigration of these young women, many of them orphans. Their passage to the colony was paid and they received an average dowry of 50 livres, along with a small hope chest containing clothing and sewing materials. In exchange, the women agreed to marry on their arrival in New France, to start a family and to help their husbands work the land. These women were instrumental in helping to populate and develop the colony. The first contingent of 36 “Filles du roi” landed in 1663. Over the next ten years, an estimated 800 young women settled in New France under the same program. If you would like to know whether one of your ancestors was a “Fille du roi,” there are many genealogical publications and reviews you can consult. However, the most valuable reference work is Yves Landry’s Les Filles du roi au XVIIe siècle, orphelines en France, pionnières au Canada (AMICUS 11402134), which was published in 1992 and which includes biographical notes. You can also visit the website of the Société d’histoire des Filles du roy. Library and Archives Canada has several historical documents in its collection pertaining to this wave of immigration, including correspondence between the Governor General of New France, Louis de Buade, Comte de Frontenac; Intendant Jean Talon; and the Secretary of State for the Navy, Jean-Baptiste Colbert. Of particular note are a letter dated October 27, 1667 (MIKAN 3037238), and a memorandum written on November 10, 1670 (MIKAN 3037252). We are pleased to announce the release of our latest podcast episode: The Shamrock and the Fleur-de-Lys. In this episode, we consult a panel of experts about the massive immigration of Irish settlers to Quebec in the 1800s. We examine the journey they made in order to establish their new lives on foreign soil, as well as the cultural bond that formed between the Irish and the Québécois. Subscribe to episodes using RSS or iTunes, or just tune in at: Podcasts – Discover Library and Archives Canada: Your History, Your Documentary Heritage. For more information on recent announcements at LAC, visit “News“.